Our FPV racing group „Aircrasher“ wanted to track our lap times. Therefore we decided to use Easy Race Lap Timer Pocket Edition (ERLT PE). To track centralized multiple ERLT PEs we used a Raspberry 3. 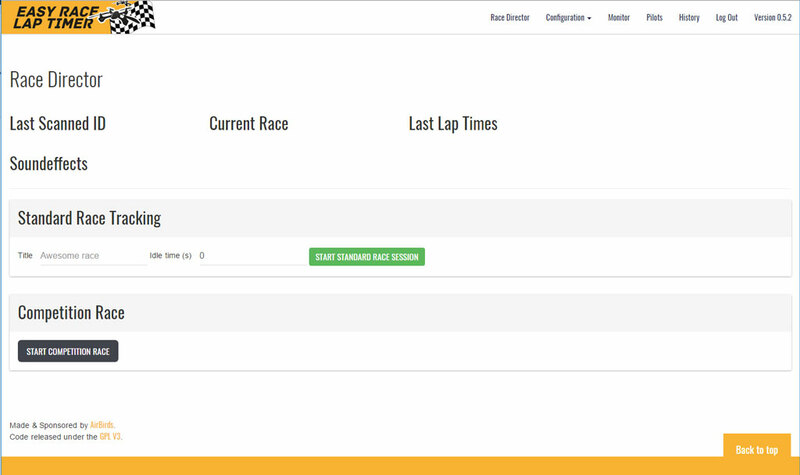 After downloading and installing the easy race lap timer image v0.6.1 from here (www.easyracelaptimer.com/downloads/) for the Raspberry Pi 3, we noticed that it had problems with the sound output. We tried to get it working by patching the error. Unfortunately we couldnt’t fix the problem. I configured the Raspi 3 as a router. So if internet is connected to eth0, Wifi users can access internet too. Here you can download my release of the image. Dieser Eintrag wurde veröffentlicht in Allgemein, Easy Race Lap Timer, FPV von alex. Permanenter Link des Eintrags. Hi, does you image still support the IR transponders? Yes, it should. I only used the image with the ERLT Pocket Editions. I hope this will help you a bit.